In rainy years, mudslides often close California Highway One, the famous coastal route. Small slides and rockfalls simply cover the road and are removed in a fairly short time, but the big ones can destroy the roadbed. As a result, Highway 1 can be closed for weeks or even months while the Department of Transportation makes emergency repairs. That's what happened late February 2017. Storms and heavy rain caused Pfeiffer Canyon Bridge to crack and start sliding down the hillside. During the same storm, nearly 5 million cubic yards of material slid into the ocean further south, a few miles north of Ragged Point. It took only eight months to replace the irreparably damaged bridge which restored access to the town of Big Sur and several state parks and beaches. Repairing the massive Mud Creek slide north of Ragged Point took longer. A new realigned roadway opened in September of 2018. You can drive on Highway One from Carmel to Lucia. From there, you have to go back north to Monterey. From Monterey go to Salinas and catch US Hwy 101 south. If you want to visit Hearst Castle or see the elephant seals at Piedras Blancas, you can reconnect with Highway 1 through Paso Robles or San Luis Obispo and go north from there. You can also try the Alternate Route from Big Sur Going Inland below. It will take you over the mountains, past a romantic old Spanish mission in a landscape that has changed little since it was built in the 1700s. If you travel on Highway 1 north from Morro Bay, you can get a few miles north of Ragged Point, which is far enough to see Hearst Castle and the elephant seals at Piedras Blancas. However, that's not far enough to see many of the coastal vistas you hoped for. If scenery is what you're looking for, detour to US Highway 101, taking it to Salinas, then go west to Monterey and go south on Highway One. Or use the Alternate Route from Big Sur Going Inland below. Several sections of the California coast are particularly closure-prone both north and south of the town of Big Sur. 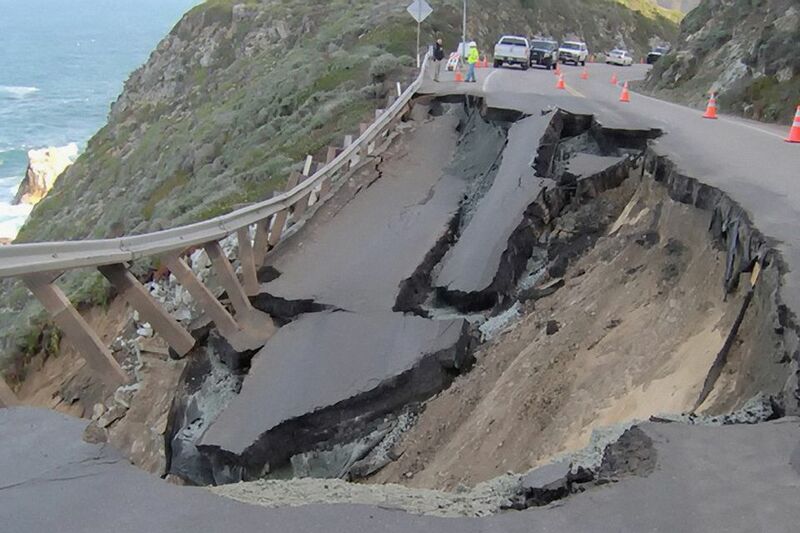 While infrequent a closure causes disruption to Big Sur businesses and residents - and consternation to tourists. If the weather is fine, check out how to get to Big Sur. Instead of wondering, "is highway one open?" before you head out, take a look at the rest of this guide. It can help you find out how to get information about Highway One road closures and what your options are if it's closed. Checking road closures is easy. Go to the CalTrans website, enter 1 (the highway number) and search. You can get the same information on mobile devices with internet browsers - or by phone at 800-427-7623. CalTrans also has an app, but it's not as helpful as it could be. You can also check their map of road closures. Highway One is a long road, but if you're planning a trip to Big Sur, San Luis Obispo County and Monterey County are the only locations you need to pay attention to. The results will look something like this, collected on March 1, 2017: "CLOSED FROM RAGGED POINT (SAN LUIS OBISPO CO) TO 15 MI NORTH OF BIG SUR /AT PALO COLORADO/ (MONTEREY CO) - DUE TO A MUDSLIDE - MOTORISTS ARE ADVISED TO USE AN ALTERNATE ROUTE." If you're not familiar with Big Sur geography, you may have to do a little searching to understand the situation. Use a map or GPS to locate the places mentioned, as well as the town of Big Sur. If you're trying to find out if you can still see some nice scenery, a map will also help you understand which parts of the road are close enough to the water to offer nice views. Advice to seek an alternate route means the road will be closed for a while. That's helpful information if you're headed out the door, but less so if you're planning a trip three months from now and want to know if the road will re-open before your visit. Unfortunately, predicting how long repairs will take to a road that barely hugs the edge of the continent isn't easy. Your best options to get some info are the Big Sur Chamber of Commerce blog or a simple internet search for "Big Sur road closure." Mudslides happen in rainy winters, so if you're planning a trip that might be impacted by a closure, your best bet is to have two alternatives in mind, check road conditions at the last minute and implement the plan you need. If Highway One is closed and your plans include traveling between Monterey/Carmel and Hearst Castle/San Simeon, you'll have to take a detour. With few roads crossing the coastal mountains, US Hwy 101 is your best bet to get around the closure. Take CA Hwy 68 between Monterey and Salinas on the north and CA Hwy 46 between Cambria and Templeton/Paso Robles on the south. If want to see the beautiful coastal scenery and find that the road is closed, don't despair. Many people confuse the town of Big Sur with the coastal area it's located in, thinking if they can't get to the town, they won't see anything beautiful, but it isn't true. If you can get as far south as Bixby Bridge or the Point Sur Lighthouse, you'll get a good sample of the coastal scenery. In fact, the nice views start just a few miles south of Carmel. If your trip-of-a-lifetime dream of seeing the coastline is affected by a closure, drive south from Carmel as far as you can, then go back and follow the routes above. If you're a bicyclist, you might just be in luck. Some closures still allow people-powered, two-wheeled vehicles to get through - and you'll have the road to yourself. Check the CalTrans website or call to find out. If you planned to go to Big Sur for the weekend and there's only one closure, you can go around it using the routes listed above. From Los Angeles, a detour through Salinas, Monterey, and south to Big Sur will add about an hour and 75 miles. From San Francisco, the detour south past Paso Robles, over to the coast and back north turns a three-hour, 140-mile trip into a 5.5-hour, 300-mile journey, but there is one more option - which is also good when the road is closed on both sides of Big Sur. Before you set out on this alternate route, check the road closure location on a map to be sure it's south of the town of Gorda. You will reach Hwy 1 just north of there. Some mapping websites don't even show tiny Nacimiento-Fergusson Road, which crosses the coastal mountains west of King City, but we know about it from experience - it's one of our favorite little back road drives. Or if you prefer your route in words: County Rd G14 (Jolon Road) begins and ends at US Hwy 101. Traveling south on US Hwy 101, exit onto it just before you get to King City. Traveling north, the exit is a few miles past Camp Roberts. From either direction, follow G-14 to Fort Hunter-Liggett. Drive through it to connect with Nacimiento-Fergusson Road. Hunter-Liggett is an active military base and public access is allowed, but they sometimes change the route through their property. Just follow the signs or ask for directions if you need them. As long as you're going to be passing through, check out the Valley of the Oaks where you'll find a Spanish mission founded in 1771 and William Randolph Hearst's "ranch," built before he finished the castle on the coast. Nacimiento-Fergusson Road will take you through the Los Padres National Forest and you'll reach CA Hwy 1 north of the town of Gorda and just south of Kirk Creek Campground.